Sometimes people want to replace all the teeth on the uppers or lowers with dental implants. 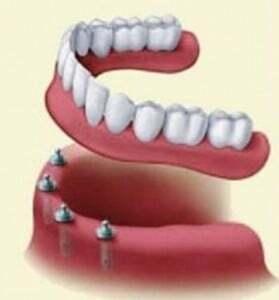 Even with our discounted prices, it is very expensive to replace each tooth with individual implants. However, a more economic solution is to place a series of implants that serve as supports to place permanent fixed bridges of crowns. So, instead of 14 implants to replace all 14 upper teeth, we can place 8 implants with some bridges to replace 12 teeth. The result is nearly $6000 less expensive. For 8 implants and standard porcelain bridges, to replace 12 teeth, the cash price would be less than $11,000 per arch. Another option that patients choose is to use a denture that is held in place by implants. 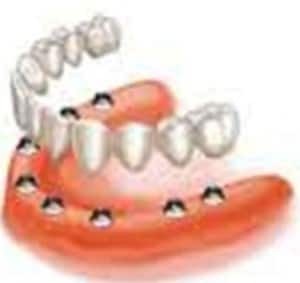 A denture supported by implants has the advantage that it is immobile and does not move around at all while you talk. If we can place 4 implants in the upper mouth, then we can make a denture that does not require a piece that covers your pallet. For 4 dental implants with a high quality denture that has been modified with receivers to snap on to the implants, the cash price would be: $5000 per arch, $10,000 for full mouth (upper and lower).